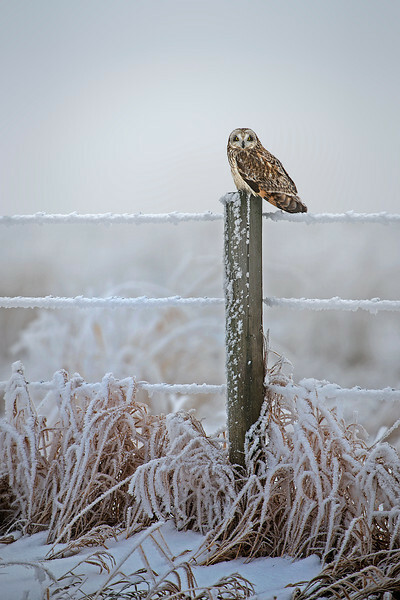 We set out one frosty morning determined to find short-eared owls. Although the light was difficult for taking photographs, we were rewarded with some very cooperative owls and a beautiful frosty landscape. These Short-eared owls have the inherent cuteness of most owls but also, each had a unique look and personality, which we soon recognized. Along the way, we also found Horned Larks and flocks of Redpolls, hunting for food in the frost. This short-eared owl sits on a magnificant perch.